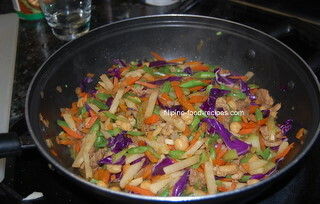 The usual vegetables used are green beans, carrots, celery, singkamas or jicama, and cabbage. Pork, Shrimp or Chicken are usually added for extra flavor. Just like the Fresh Veggie Spring Roll, it is served by topping with a sweet sauce with fresh minced garlic and sprinkling of ground peanuts. Our version of this dish is with Garbanzos or Chickpeas, Sweet Potatoes, and Red (instead of the regular) Cabbage. 1 Saute the garlic and onion, add the pork or chicken and cook for 3 minutes. 2 Add the carrots, sweet potatoes and 1/2 of the chicken broth. Cover and bring to a boil. Let the veggies cook for 3 more minutes. 3 Add the rest of the veggies, except the cabbage and the rest of the broth, then season with salt and pepper. 4 Cover and bring to a boil. Cook for 5 minutes. 5 Turn the heat off, then mix in the cabbage. Residual heat will partially cook the cabbage. Set aside while you cook the sauce. 6 Cook the lumpia sauce. 7 To serve, the sauce goes on top of the veggies, then topped with ground peanuts. The red cabbage is actually purple in color and should not be overcooked, or it will lose it's vibrant color. Do not overcook the vegetables, the singkamas and celery should still be crunchy - however, the carrots and sweet potatoes are cooked a little bit more.